Are You Brushing Your Teeth and Noticed A Small Amount Of Blood On Toothbrush? What Are The Fibers Of The NIMBUS Made Of? 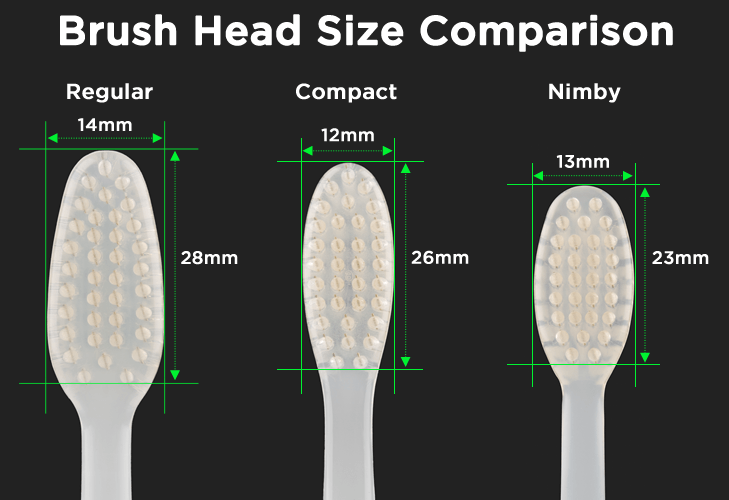 What Size Of The NIMBUS Toothbrush Head Is Best? There is a variety of neon colored, multi-layered toothbrushes on the market. So, it has become increasingly hard to find a simple and effective extra soft toothbrush for both healthy and sensitive teeth. NIMBUS MICROFINE toothbrush is extremely gentle on teeth and gums. With great minimalist design and multicolored handles, these toothbrushes won the hearts of many of their users. Are you in a hurry? >>> Click here to buy Nimbus Microfine toothbrush, our editors’ choice among all manual toothbrushes on the market. Do not panic! This unpleasant phenomenon is known as bleeding gums or gingivitis. But how to prevent or stop the inflammation of the gums? By definition, gum inflammation occurs if you do not thoroughly daily clean the accumulated soft dental plaque from all the surfaces of teeth. Uncleaned plaque with its toxic composition attacks gum tissue, causing thereby the inflammation, and it consequently affects the overall health. And not to mention the teeth loss as well. This is because bacteria from it flows through blood travels around the body. The aim is, therefore, to completely remove dental plaque. That is a sticky biofilm substance composed of bacteria which are constantly accumulating and growing. If it is not removed, it reacts with calcium from saliva. Then a hard dental plaque and tartar are accumulated. And those can only be removed by a dentist. Today, with the help of NIMBUS Microfine toothbrush you can have complete control of dental plaque. Only this way you can avoid formation of cavities, bleeding gums, bad breath, and later on consequences of gingivitis and periodontitis, as a result of poor oral hygiene. There is no justification not to do so. However, the cause of gingivitis is not only irregular teeth brushing. A large number of people daily brush their teeth, but the gingivitis remains a problem. The reason for this is using a toothbrush with a small number of fibers. Manual toothbrush usually contains 500 to 800 fibers. Those are hard and can not completely clean the surface of the tooth. They also have a harder time reaching areas between the teeth and gums. So-called gums edge. NIMBUS toothbrush contains a large number of only soft bristles that are equally excellent at removing dental plaque and reaching all surfaces of the tooth. A good toothbrush is not expensive in comparison with the cost of dental intervention! To maintain adequate oral hygiene, it is important to have an appropriate toothbrush. On the market are countless products of all shapes and sizes, made of more or less quality materials. The choice of toothbrushes is large and therefore it is harder to know what to look for. In specialized stores and pharmacies, you can become familiar with a range of toothbrushes. The problem with such choice is that their development is in the hands of cosmetic companies, which are not guided by the advice of doctors and specialists, but by principles of marketing. Simply put, they produce toothbrushes that will attract customer with its appearance. Thereby, they are not taking into account the function that they should perform. For the uninformed customer, it is very difficult to make a proper choice. In this case, we can not stick to the saying “if it is more expensive, it is also better”. NIMBUS toothbrushes are very affordable and innovative. They were created by an American periodontist Dr. Stanley Klein. He created them with one single goal – to provide the most effective plaque removal with the maximum preservation of dental tissue and gums at the same time. They’re only available online, so you can order them here. How would you choose the best manual toothbrush? You have to consider first what kind of product you need. The main feature that we expect from a toothbrush is that it is very efficient at plaque removal from our teeth. To achieve this product should be so designed to be able to reach all parts of the jaw. 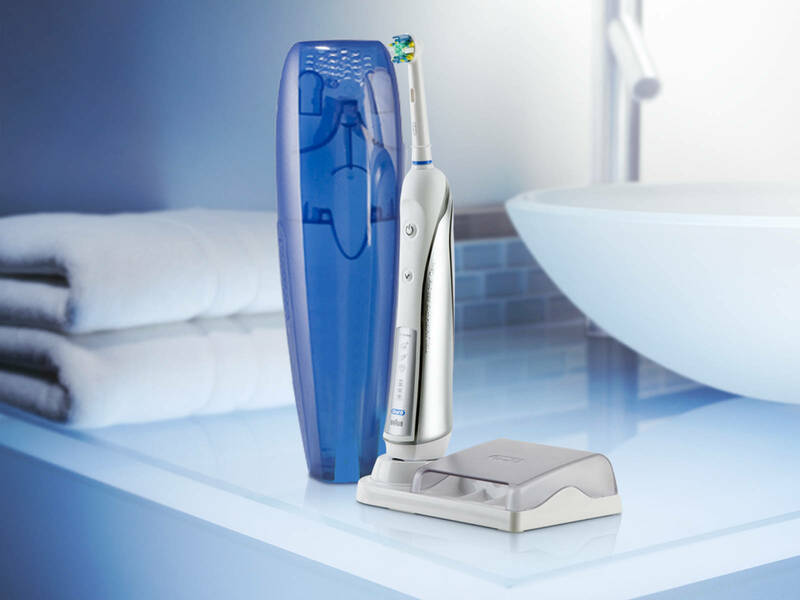 Choosing the best manual toothbrush begins with choosing fibers on the product. They are the most important thing because tooth comes directly into contact with them. 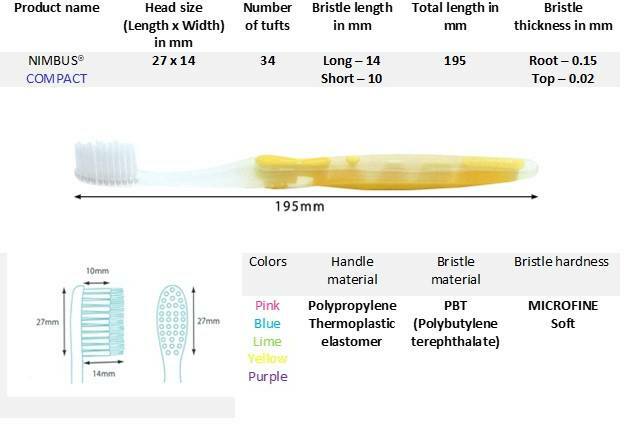 Note the type, shape and arrangement of the fibers before buying each manual toothbrush. 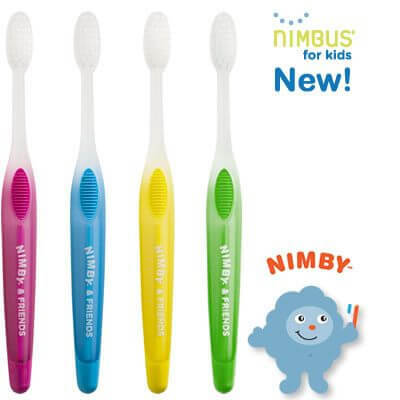 NIMBUS toothbrushes have a quality small and compact head, which can reach all surfaces. They have fine soft fibers that prevent damage to the gums. It has two types of fibers: Extra Soft fibers for reaching critical areas of tooth and Support Soft fibers for effective plaque removal. Manual brushes contain 500-800 nylon fibers. With its use, much of the plaque stays on the teeth and often leads to bleeding gums. Because of that, it is necessary to use pressure to remove plaque from hard to reach areas. By using a greater number of fibers, cleaning is better and more layers of dental plaque are removed. Their shape is also important. Product with sharp bristle peaks is more destructive to tissue of the mouth than rounded ones. That is quite difficult to see on each brush, because their fibres have very small peaks. Worn out toothbrushes have inverted peaks and lose their effectiveness. The most important part of the product is it’s fibers and not the shape of the head. And it is important that they are of good quality. Usually, toothbrushes have 6 strands per length direction and 3 strands of fibers in the width. Toothbrushes with lots of fibers have 13 strands along length and 4 in the width. With such toothbrushes, fibers are closer together, so it is easier to maneuver around gums. The product you select should have a lot of soft strands and rounded fibers. The packaging of the product should always be labeled and usually tell how much fibers toothbrush has. Also, toothbrushes on the package are marked hard, medium or soft. Today, there are specialized toothbrushes, labeled super soft and ultrasoft. Dentists (especially periodontists – dentists specializing in gum diseases) usually recommend using soft fibers. However, a product labeled ultrasoft can also be used daily. They are specially aimed at people who have canker sores in the mouth or sensitive teeth. But everyone can use them. Their fibers are strong enough to thoroughly clean your teeth and not to cause any harm at the same time. So rather, opt for toothbrushes with the word soft or super soft. With a soft toothbrush, you can still achieve the best effect. Primarily because you will not avoid brushing along the gums, where plaque accumulates the most. Soft toothbrushes are also recommended because along with toothbrushing at the same time a gentle massage of gums is happening. That, in turn, stimulates circulation in the gums. That is an extremely beneficial effect on the entire supporting apparatus of teeth. 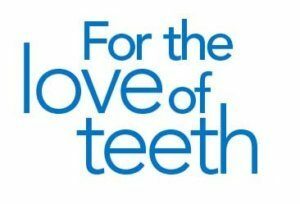 Plaque that sticks to your teeth is soft, but also the soft fibers are the most successful in the fight against plaque. On the other hand, the soft bristles that are rounded at the top, have a beneficial effect on the tooth enamel and gums. Hard toothbrushes and also not properly cleaning the teeth can harm the gums and increase their sensitivity. They often create micro pitting on the surface of a soft tissue and harm it. And on the chewing surfaces of teeth, they do not give a better effect than soft ones. Hard toothbrushes are more recommended for cleaning dentures. For problems with gums (gingivitis and periodontitis), dental professionals are advising ULTRASOFT toothbrushes that have a beneficial effect on the already inflamed gums and do not damage them further. NIMBUS toothbrush with double soft fibers is also strong enough to clean the plaque from the teeth and soft enough that it does not damage the enamel or gums around the teeth. thin and thick fibers – which penetrate to reach more difficult places (the gum edge). Do you choose a manual toothbrush with natural or artificial fibers? In this case, however, you should choose an artificial one! The fibers of the product can be made of natural and artificial materials. Usually, everything natural is better, but as toothbrushes are in question situation is the opposite. Natural fibers are made of all natural materials, which swell when moisturized and therefore the fibers become oversized. They cannot enter into all the tiny spaces between teeth and/or teeth and gums that should be cleaned completely. With synthetic fibers, there is no swelling. They retain the same volume and elasticity and more easily reach all areas that need to be cleaned. Also, natural fibers dry more slowly after washing so bacteria build up more easily. Synthetic fibers dry quickly, and it is less likely they will retain bacteria on them. If you use a product made out of natural fibers you can never be sure that all of the fibers are of the same strength. Today, fiber toothbrushes are usually made of nylon and/or polyester. Such hard, medium and soft bristles do remove dental plaque, but hard and medium ones can permanently damage the surface of the gums, tongue, and cheeks. They can cause periodontal disease, and also damage the fillings. Studies show that soft toothbrush is equally effective at removing plaque compared to medium and hard toothbrushes. 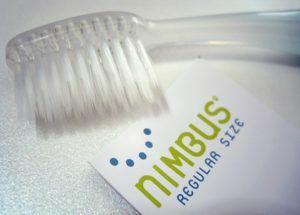 The dual-length bristles of NIMBUS toothbrush are not made out of boar’s hair or nylon. Instead, they’re made out PBT, which absorbs less water than nylon. It is important to let your brush dry out between brushings. Drying out does help reduce the number of bacteria. The head of the product should not be too big because it will not be able to “crawl” into the spaces behind the last molars. It will also not be able to clean top surfaces of wisdom teeth if they are not in line with the biting surfaces of other molars. If oversized, heads are more difficult to handle, and the brushing technique is limited and incomplete. NIMBUS toothbrushes are designed to suit everybody’s taste. They are extremely soft, and on the market, you can find toothbrushes with a two head sizes – Regular and Compact. NIMBUS MICROFINE REGULAR is designed mostly for men, while NIMBUS MICROFINE COMPACT can be used by both man and women and is more recommendable. The brush head of the Compact measures roughly 1″ in length and 1/2″ at the widest point of the width. It is also slightly narrower at the top and bottom. The actual brushing part is larger in the Regular toothbrush. Toothbrushes that have a large work area (this is the part that holds the fibers) have difficulty reaching around the teeth at the back of the mouth. After washing they leave food in your mouth. That is why you should choose a toothbrush that has appropriately sized head. When you choose the size of NIMBUS toothbrush, what’s left is just to find a color that suits you and enjoy your toothbrushing. The handle of the toothbrush needs to have some minimum level of elasticity to lighten the load to the arms when manipulating and adjusting head brush to all chewing surfaces. The handle should be stiff, straight and not slip, with the length of 17-25 cm. For people who are not too skilled, it is recommended to use a toothbrush with thicker and shorter handle. That enables them to hold it securely and control more easily. 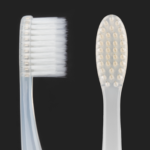 The texture on the handle will reduce the slip of the toothbrush, and allow you easier and more regular toothbrushing. 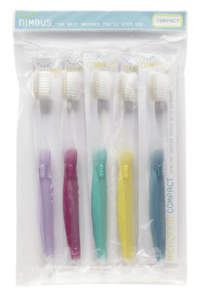 NIMBUS toothbrush is easy and comfortable to hold. This toothbrush is good for prevention of gum disease and was developed by U.S. periodontist Dr. Stanley Klein. 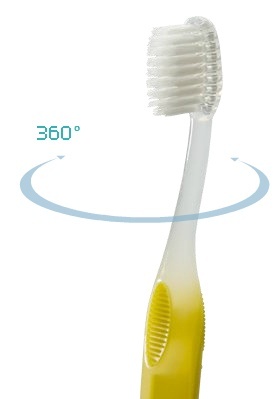 Properly sized elliptic toothbrush head is able to reach all areas of tooth easily. It has longer bristles with the rounded tops that slide beneath the gum line to brush plaque away and clean between teeth. 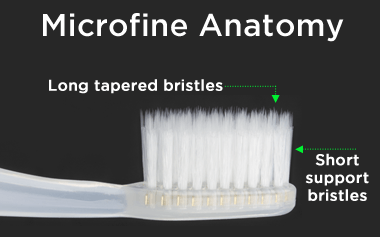 They have shorter bristles with a soft touch that polishes the surface of each tooth. The longer ones that brush over your gums are so soft, it feels like a massage. Shorter bristles are denser and really clean your teeth. Extremely soft and pliable bristles able to remove plaque thoroughly without hurting gums. 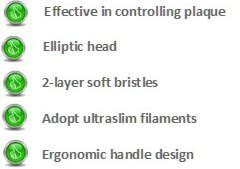 Ultraslim, extra soft filaments can reach periodontal pockets and remove plaque without hurting gums. Have a good effect on inflammatory gums and sensitivity. Have a good impact on hygiene management after oral surgery. Perfectly fits all hands, especially small hands of women. A gentle and stable feeling of use. They wear out a bit more quickly – but they are far gentler on gums. They are also less expensive than many toothbrushes so having to replace them a little more often isn’t a big deal. 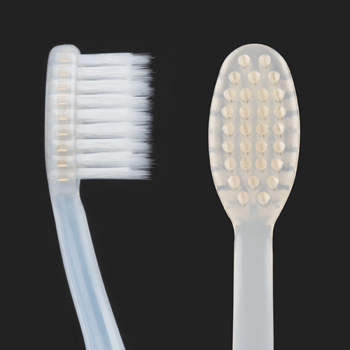 The secret of NIMBUS toothbrush is in its bi-layer ultraslim fibers with rounded tips. They do not contain nylon fibers as others on the market, but their fibers are made of a special material called the PBT, which is very delicate and thin. An unusually large number of fibers on the heads of the toothbrush will clean your teeth perfectly and without traumatizing the gums. 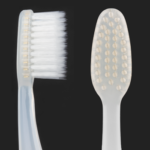 NIMBUS toothbrush contains from 1160 to 1260 soft, densely arranged, fine end-tapered bristles. They effectively clean teeth and gums, without hurting of teeth necks. These soft PBT fibers are less flexible than nylon fibers and retain their strength in the moisturized state in the mouth, as well as in the dry state. These properties enable the production of toothbrushes with the huge number of extremely thin quality fibers. This is perfect for those without gum disease who are used to using a hard and medium toothbrushes and want to get used to using a soft toothbrush. It is also recommended to patients who need a bit more pressure, but still want to be gentle to their gums. NIMBUS toothbrush cleans teeth without any damage to the gums and teeth. It can be used by patients with diseases of the gums. All toothbrushes have the square bracket that allows keeping the toothbrush under the ideal angle of 45 degrees to the surface of the teeth and gums. This toothbrush helps you eliminate those gum problems and to build healthy gums. That way your gum line doesn’t recede. The advice is, you don’t need to brush very hard. Just go softly and get underneath your gums and your teeth in a circular motion at a 45 degrees angle. Square-handle – enables cleaning the teeth under the ideal angle of 45 degrees and ensures much better cleaning. Well-kept and beautiful teeth mean self-esteem, self-confidence and increase the chances for success in love and business. So, condition yourself for success, feel the tenderness of NIMBUS MICROFINE toothbrush and allow your teeth and gums to fall in love with it.